What is a Designer of the Month? 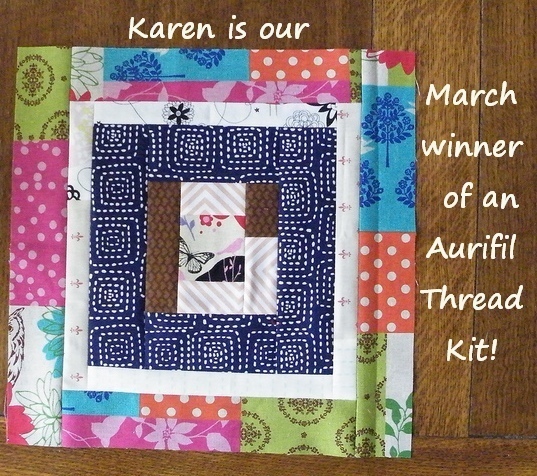 Aurifil has many wonderful Quilt designers that use our thread on a regular basis. 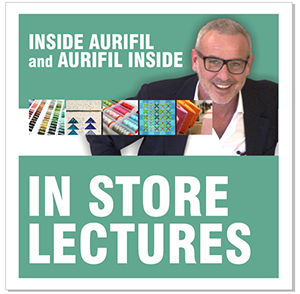 For the last few years we have showcased a designer a month on our blog. I interview the designer so we get to know them. 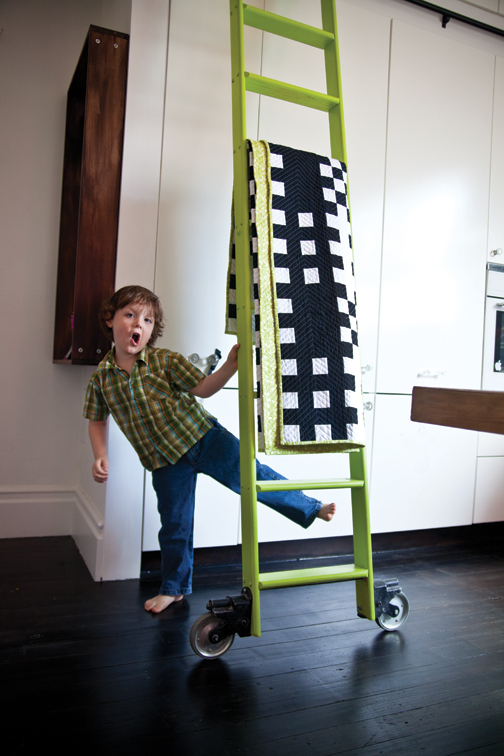 And the designer gives us a free block that many of you are making as a sampler. 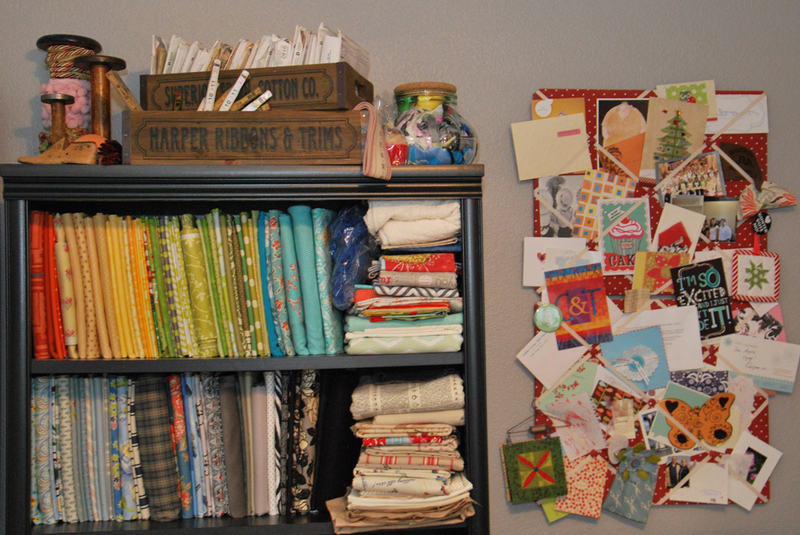 If you share your block in the Flickr folder we pick a thread kit winner EVERY MONTH! Is there a full Supply list? No. This is a challenge, there is no supply list. But we have a suggested fabric list to share CLICK HERE And in December I design a setting for the blocks after I see what they look like. Where do I find the Free pattern? The Designer’s free block is ALWAYS in the same spot. At the end of their interview with the PDF to click RIGHT UNDER the block photo. Easy! We do hope you get to know our featured designer with the interview and thank the designer for the gift of a super block! Is there a way to find ALL the Designer blocks from years gone by? Yes! It is the tab on the right sidebar called “Designers of the Month”..Click that for every post in the series. This year the designer blocks reflect a woman who has given them inspiration. 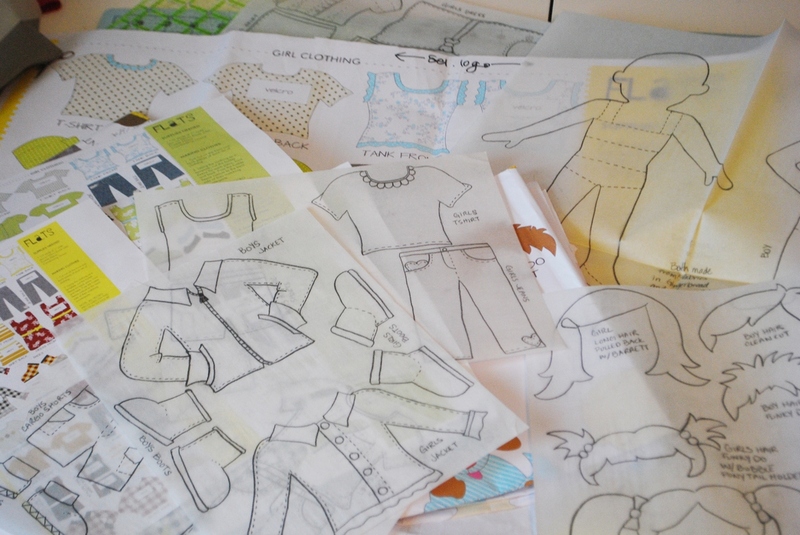 I am so excited to get to know the inspirations behind our wonderful designers! My first quilt sighting was probably the day I was born. 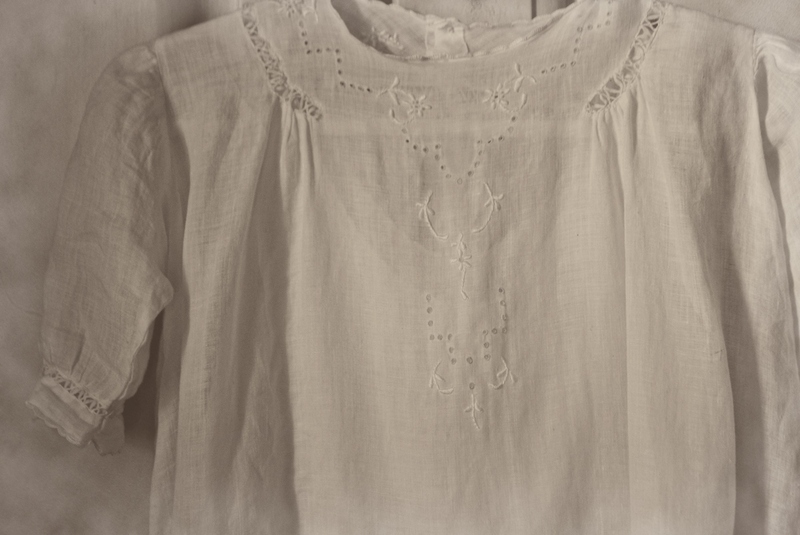 I grew up in a family of talented women that did various forms of knitting, stitchery, sewing, and quilting. 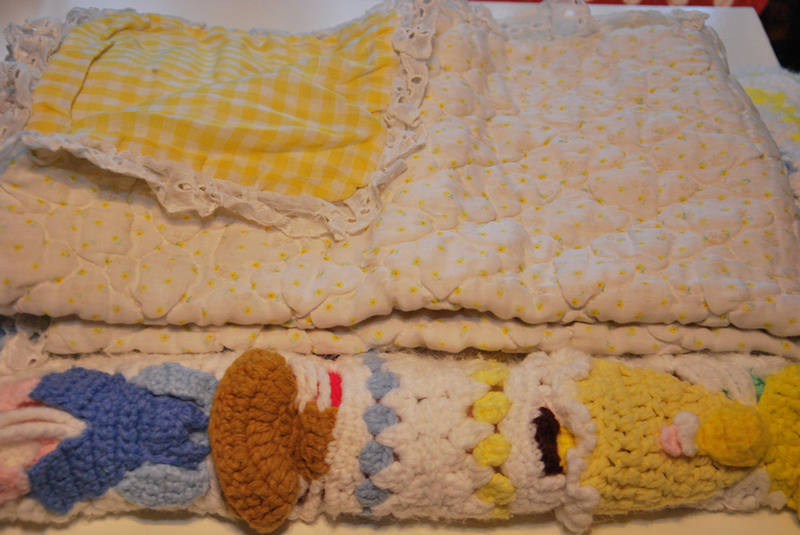 My baby blankets included a cross-stitched blanket, a knitted sleeper, and a quilt all handmade by my grandmothers. My favorite quilt just might have to be one that I “adopted” from my mom’s collection when I was in high school. 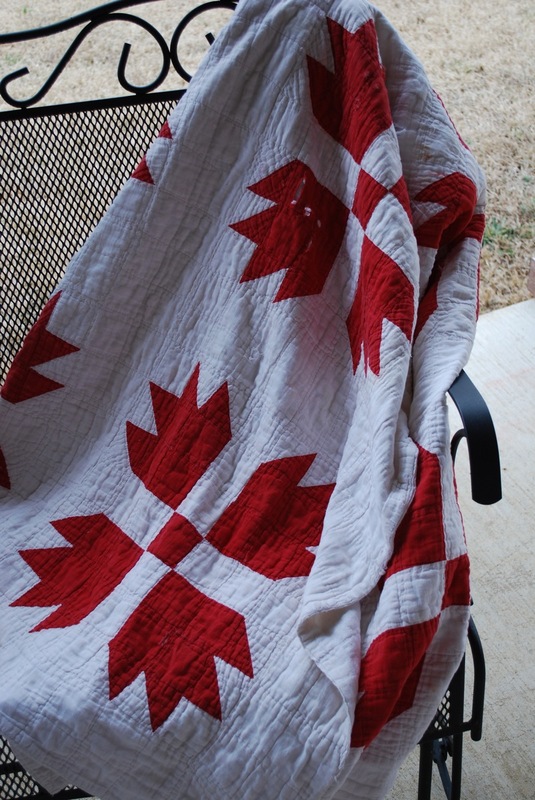 It was hand quilted by my great-grandmother and is made from solid white and red fabrics in a simple bear paw design. 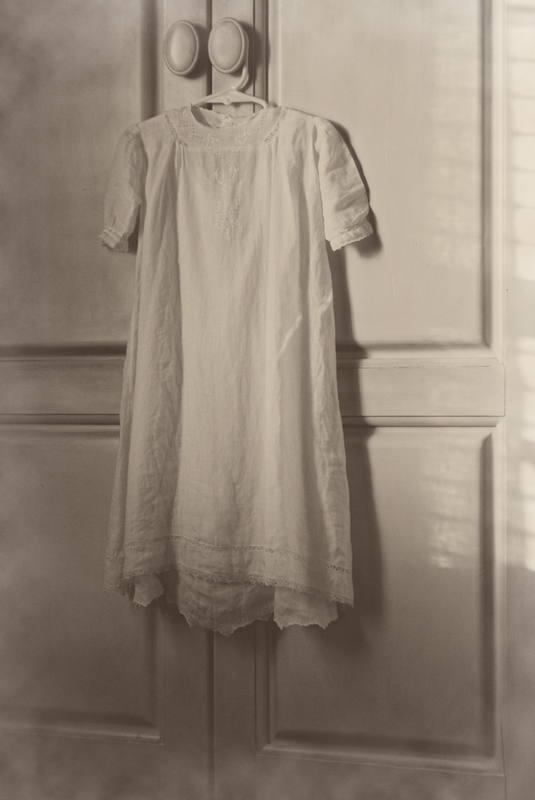 I absolutely love this quilt and the tatters worn on it, proves just that. My first “real” quilt that I ever made was when I was 14 years old. I used a pattern from Donna Poster titled The “Foldy” Stuff – Log Cabin. I thought the style of this quilt was unique in the fact that all the pieces had a folded element to them. I gave this quilt to my Grandma B soon after I finished it and I just recently got it back from her. 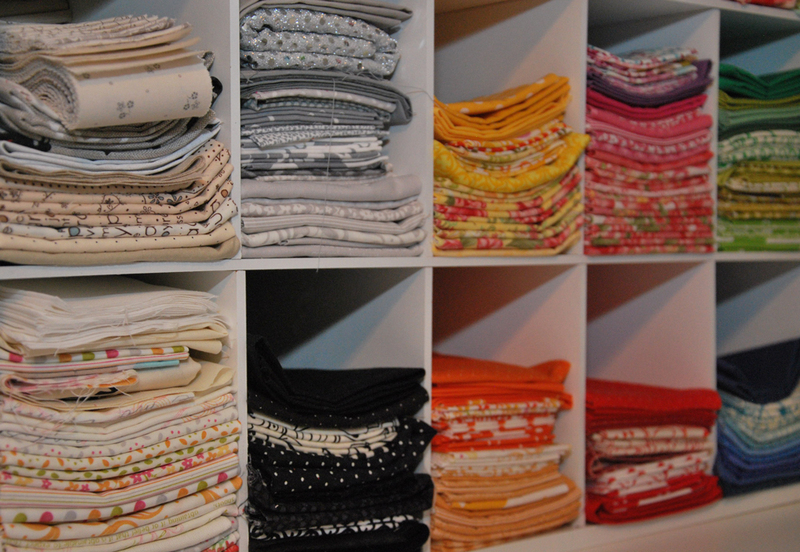 I think what draws me to a quilt is the minimal use of color. 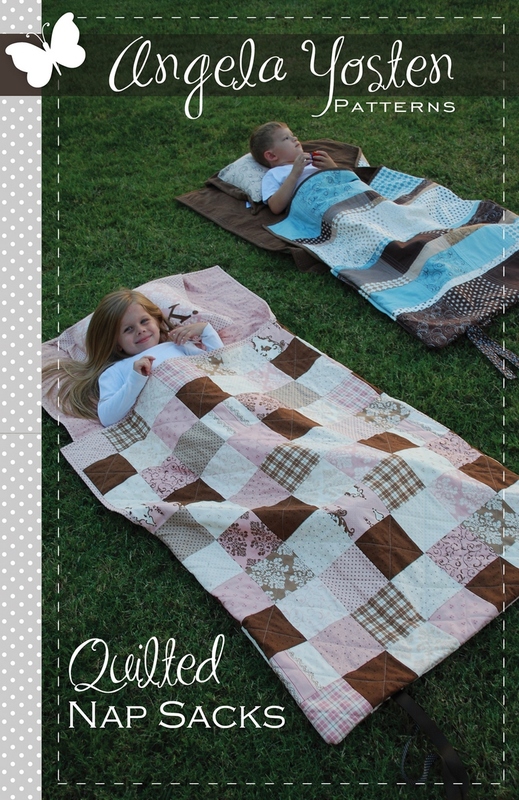 Two-toned quilts, Simple and Modern quilts are what I am drawn to mostly. I especially love to see the artistic quilts of portraits and real-life scenes. 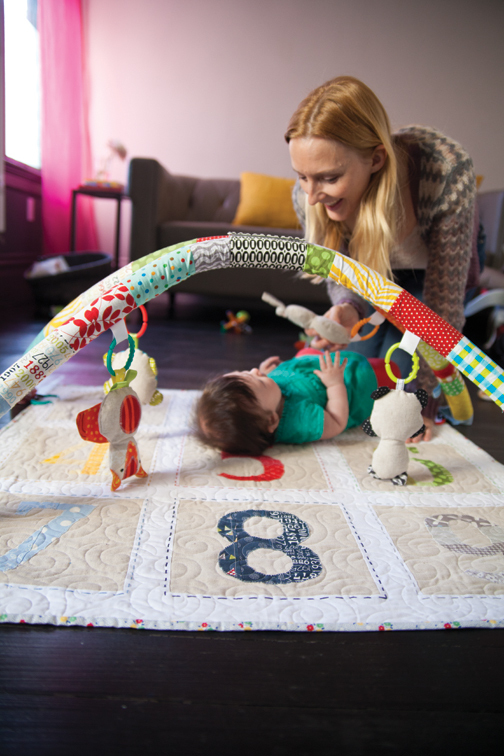 For someone to capture the movement of life in a still quilt puts me in a state of awe. Simply amazing! We all have parts of the process we ‘prefer’ more than others. 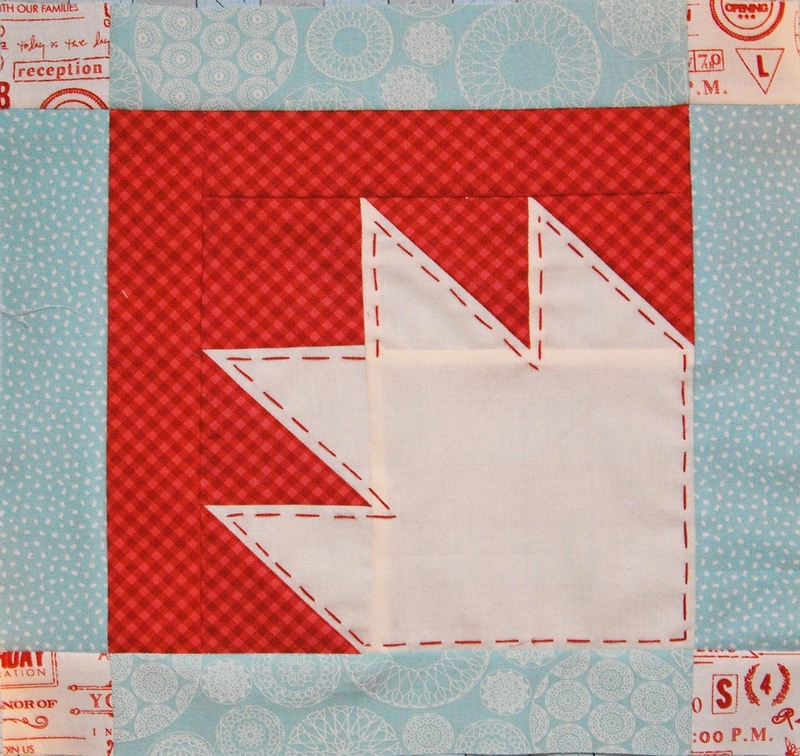 What part of quiltmaking do you ‘Prefer’ most and why? And which the least.. and why? 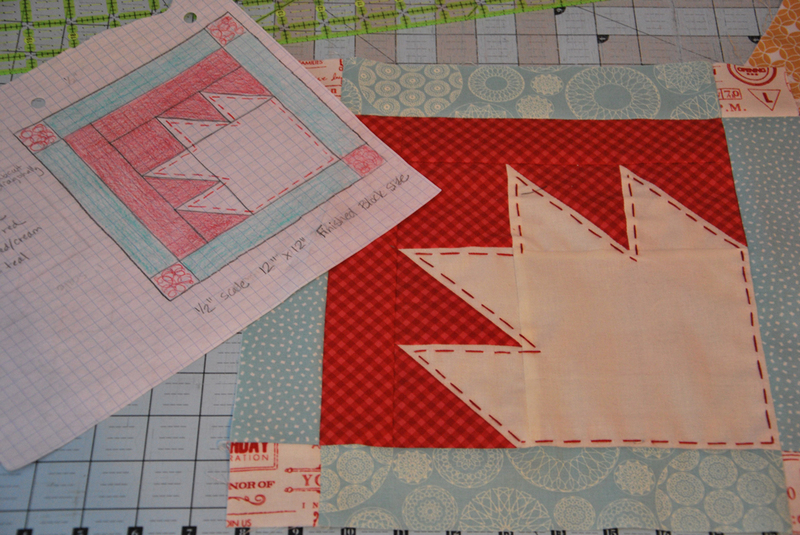 I enjoy making quilts, but I love making dimensional sewing projects even more. Coming up with an idea and then figuring out how it is all going to be constructed is my absolute favorite. 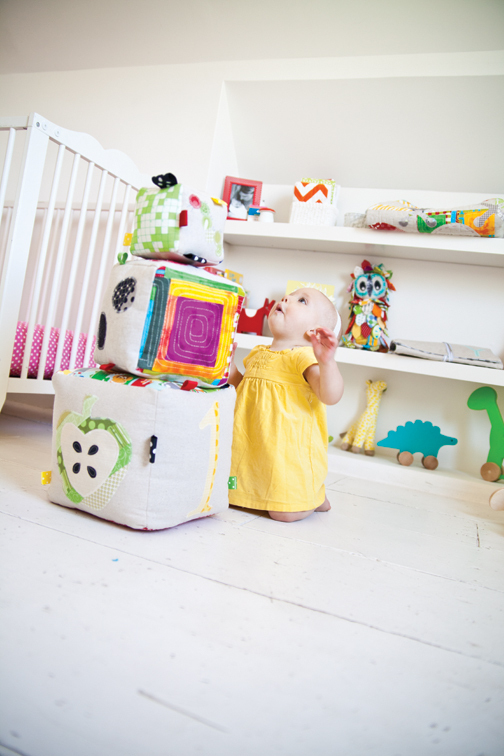 Bags, Quilted Nap Sacks, and Baby Play Mats are just a few of the projects that I find joy in designing. My least favorite part of the Quilt Process is the actual quilting the layers together and binding the quilt. 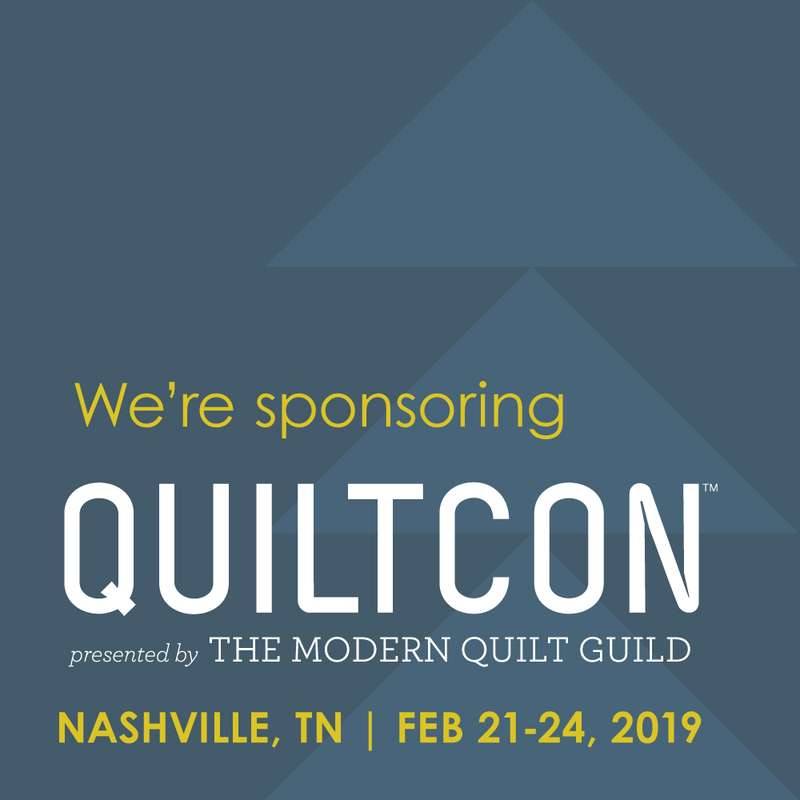 I prefer to send my quilt tops out to be quilted and the binding step is saved for car trips, sitting at the kids practices, or in car line at school. I love creating art and designing, however my career is actually as a Web Developer. I am a full-time Webmaster for Moda Fabrics / United Notions. 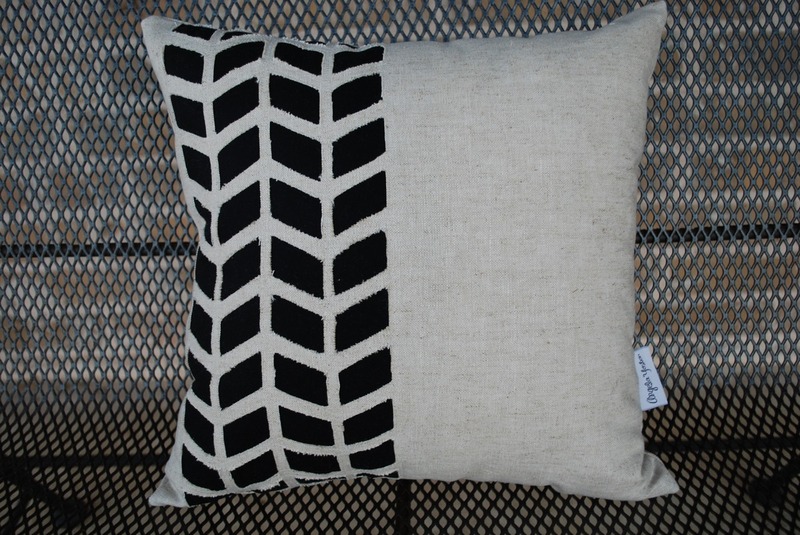 I created a pattern line as an outlet for me to share my creations and designs with others in my spare time. 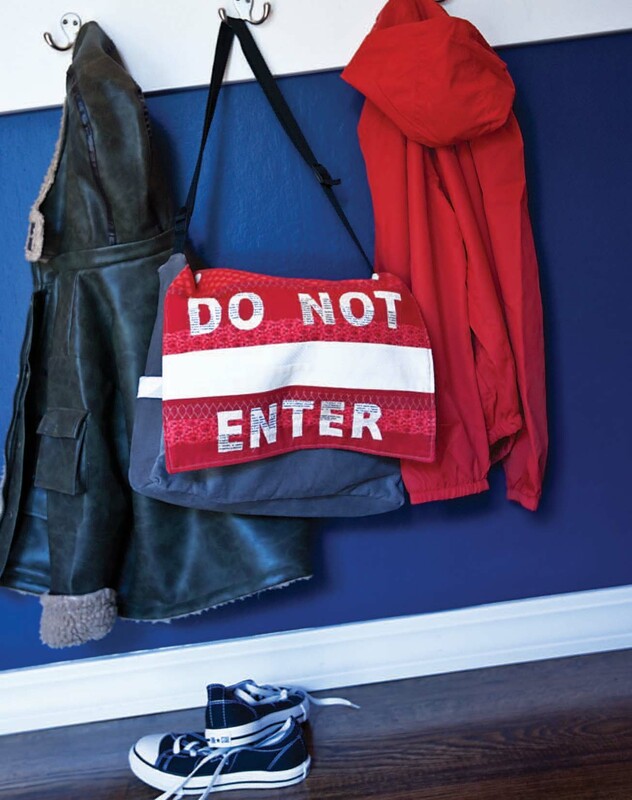 I have authored two books with Stash Books, Sew Modern Baby (2013) and Stop. Go. Quilt. Sew! (2012) I am a Contributing Author in the Moda Bake Shop books, Sweet Celebrations (2012) and Fresh Fabric Treats (2011). I have also contributed to books, Modern Blocks (2011) and Amish Quilts (2013). 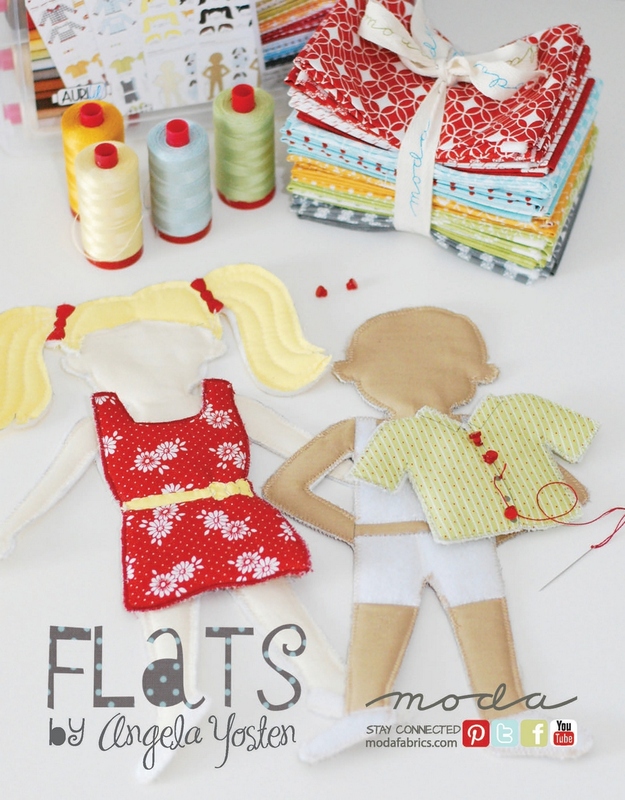 In 2013, my Flats dolls designs made their way onto fabric manufactured by Moda. Talk about exciting! 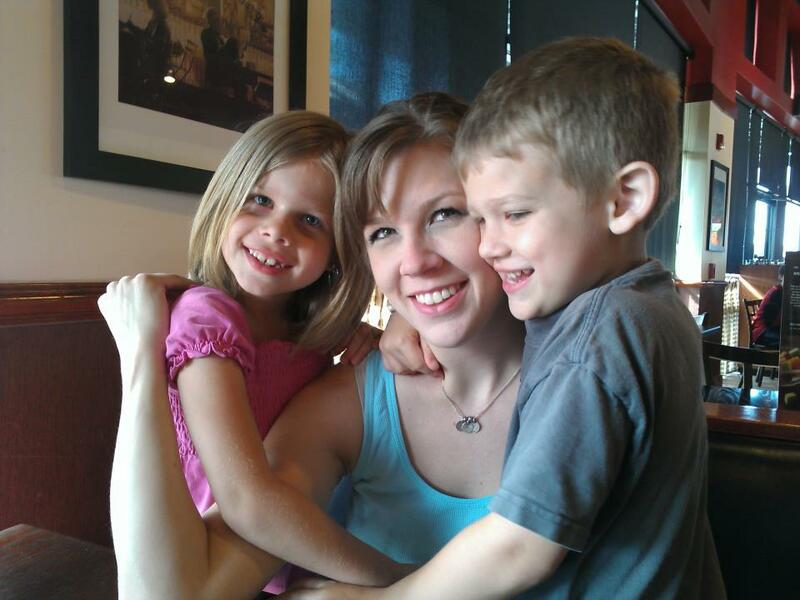 I could not believe my little people inspired by my two oldest kids were printed on fabrics! Then to top that off, Aurifil came out with a collection of threads to match my Flats fabrics. Whew! That was an exciting year. I have always enjoyed art, from drawing portraits and oil painting to designing a line of sewing and quilt patterns and a fabric collection. When I design and create, it is my way of having some “me” time. It is my escape to do what I want to and how I want to. My favorite place is my home. We are what you would call home-bodies. 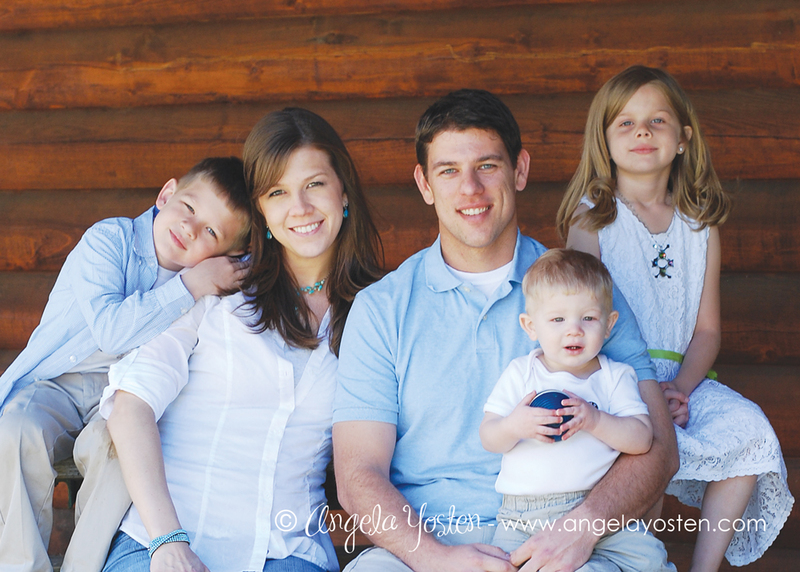 We enjoy spending time with our family and just doing what we love at home. When we go out, we like to venture to our favorite eating places in Frisco at Corner Bakery, Chick-fil-a and Jake’s Hamburgers. I love to machine applique. It is a quick and easy way to take something plain and generic and turn it into something unique and special in a matter of minutes. 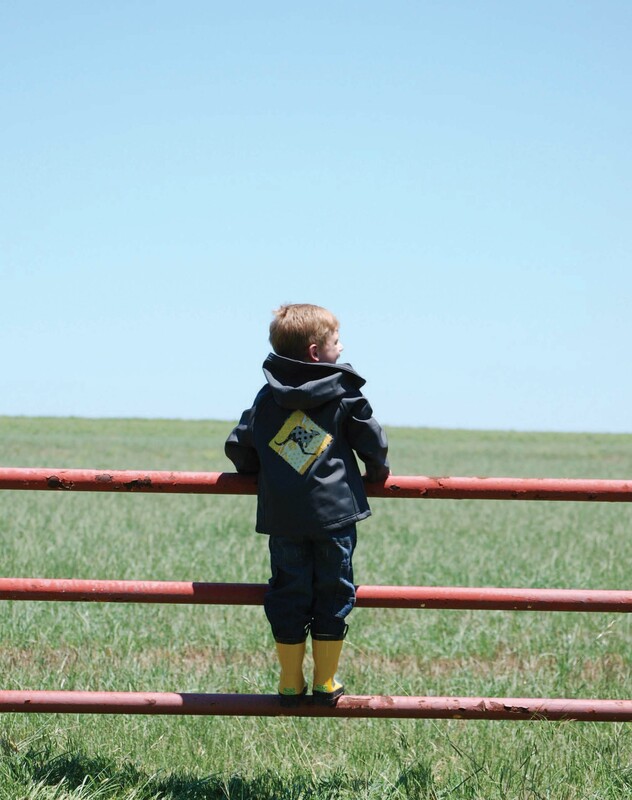 I add applique shapes to my kids store-bought clothing, jackets, etc. 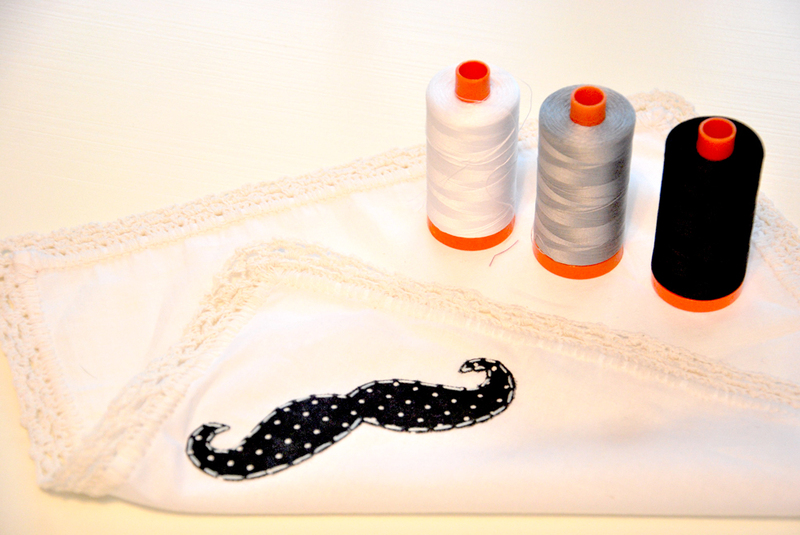 You can even take it a step further and add an applique to a pillow, quilt, or bag that you make from start to finish. It doesn’t have to be complicated… I personally like to keep it simple. 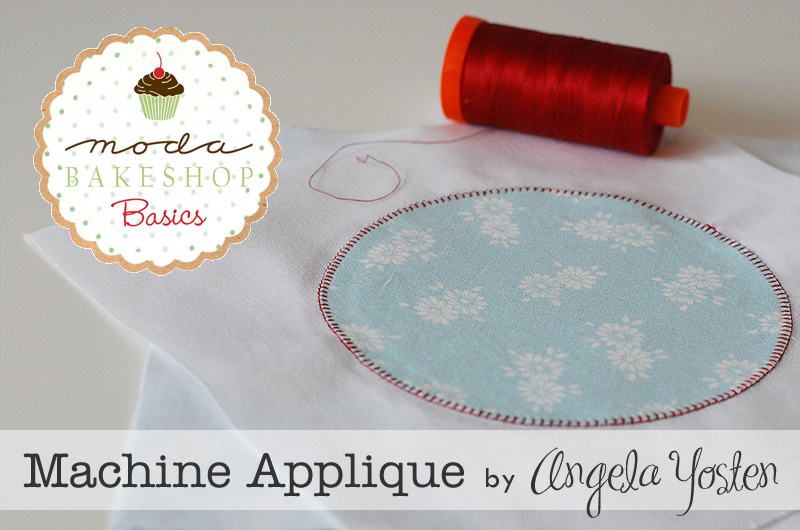 Check out my tutorial on the Moda Bake Shop with some tips for Machine Applique. If I had to pick my 3 most favorite colors of Aurifil Thread, I guess I would have to go with white (2024), black (2692) and grey (2606). I know, boring, right? Those are the colors of thread that I use the most, so it just seemed the most logical to pick those colors. Now, honestly, who can only pick 3 colors from their plethora of colored and variegated threads? I want them all! Don’t you? 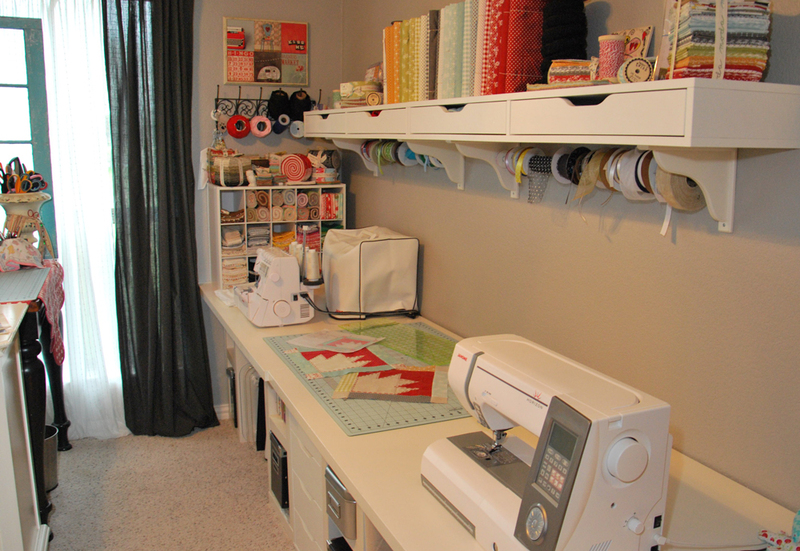 My Studio is separated into two separate areas… my Computer work area and my “play” sewing area. This is the room I escape to for just about everything. 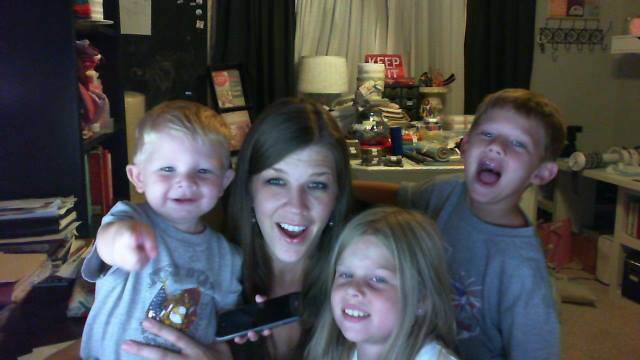 If the kids are looking for me, they come to my office/studio (well… that is if I haven’t locked myself in the bathroom). 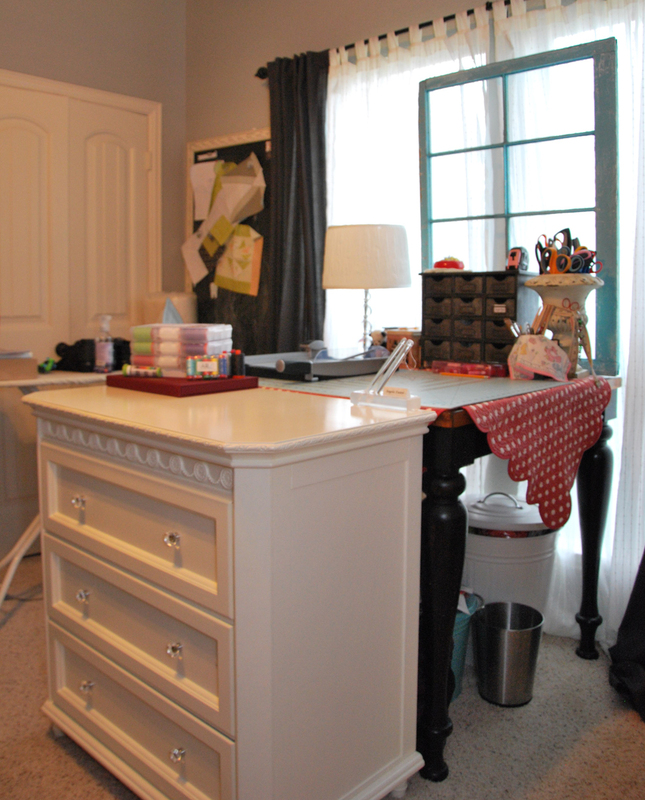 If I could change anything in it, it would be for it to be magically cleaned up after I get done working on projects. If you could train with, or work with one person for a day.. who would it be? If I could follow one person for a day, I think I would have to pick my Great-Great Grandma Smisek. 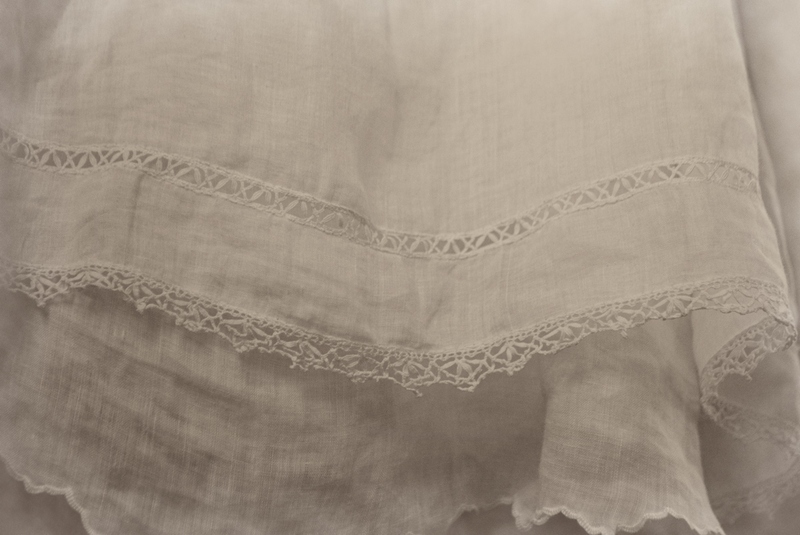 I would love to be able to watch her and learn how to do some of the tatting that she made on our family’s linen baptism gown. I am sure she used to do other beautiful tatting back in her day like the gown that has been worn by 3 generations so far. My Great Grandma Bruns was the woman that inspired my Quilt Block. She taught my mom to sew when she was a little girl and my mom, in turn, taught me and my little sister. The Bear Paw Quilt she made long ago has always been my favorite quilt. So, with my block for April, I created a simple bear paw design featuring some hand stitching details along the inside of the paw. 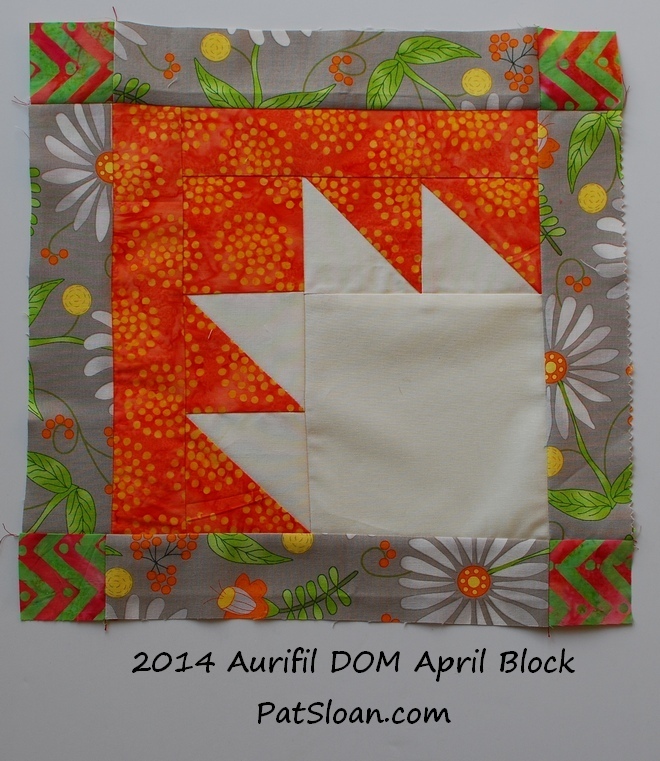 CLICK over to my blog for a tip on how I laid out fabric to audition this block AND see all my blocks together! me too! 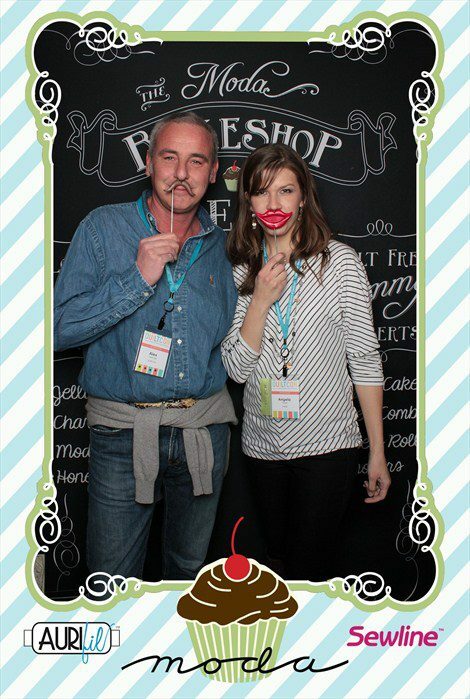 Thanks for stopping in! Pat — thank you! This is a fantastic interview with Angela and how special to get this view into her home and creative world… Angela – love the block – thanks for sharing your talent with us! Thank you for stopping in Karen! Thanks so much for your comment, Karen! I’m with you it’s hard to pick just 3 colours out of the line up if I had the money I would buy 1. Of everything!! !